American orbital launch vehicle. MSFC study, 1968. Rehashed the Boeing 1967 studies, covering a variety of stage stretches and 120, 156, or 260 inch solid rocket boosters, but with S-ID stage-and-a-half first stage. Status: Study 1968. Payload: 326,500 kg (719,800 lb). Thrust: 161,846.50 kN (36,384,541 lbf). Gross mass: 9,882,100 kg (21,786,300 lb). Height: 102.00 m (334.00 ft). Diameter: 10.06 m (33.00 ft). Apogee: 185 km (114 mi). LEO Payload: 326,500 kg (719,800 lb) to a 185 km orbit at 28.00 degrees. Payload: 112,000 kg (246,000 lb) to a translunar trajectory. Flyaway Unit Cost 1985$: 736.600 million. Stage 0. 4 x 260 inch solid FL. Gross Mass: 1,648,355 kg (3,634,000 lb). Empty Mass: 156,126 kg (344,198 lb). Thrust (vac): 35,391.395 kN (7,956,302 lbf). Isp: 263 sec. Burn time: 114 sec. Isp(sl): 238 sec. Diameter: 6.60 m (21.60 ft). Span: 6.60 m (21.60 ft). Length: 30.48 m (99.99 ft). Propellants: Solid. No Engines: 1. Engine: AJ-260X. Status: Study 1968. Comments: 260 inch solid booster - full length. 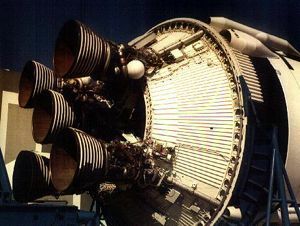 These would have been the flight configuration motors, replacing the Saturn V first stage or being used as booster motors in various Uprated Saturn and Nova configurations. Stage 1. 1 x Saturn S-ID Booster. Gross Mass: 67,100 kg (147,900 lb). Empty Mass: 67,100 kg (147,900 lb). Thrust (vac): 30,962.500 kN (6,960,647 lbf). Isp: 304 sec. Burn time: 154 sec. Isp(sl): 265 sec. Diameter: 10.06 m (33.00 ft). Span: 19.01 m (62.36 ft). Length: 42.07 m (138.02 ft). Propellants: Lox/Kerosene. No Engines: 4. Engine: F-1. Status: Study 1967. Comments: Boeing studies, 1967:'Stage and a half' S-1C with four outboard F-1's jettisoned and inboard F-1 functioning as sustainer as in Atlas. Booster half stage recoverable. Mass estimated based on double mass of four F-1's (based on Atlas example). Stage 2. 1 x Saturn S-ID Sustainer. Gross Mass: 2,219,100 kg (4,892,200 lb). Empty Mass: 68,100 kg (150,100 lb). Thrust (vac): 7,740.300 kN (1,740,089 lbf). Isp: 304 sec. Burn time: 315 sec. Isp(sl): 265 sec. Diameter: 10.06 m (33.00 ft). Span: 19.01 m (62.36 ft). Length: 42.07 m (138.02 ft). Propellants: Lox/Kerosene. No Engines: 1. Engine: F-1. Status: Study 1967. Comments: Boeing studies, 1967:'Stage and a half' S-1C with four outboard F-1's jettisoned and inboard F-1 functioning as sustainer as in Atlas. Booster half stage burns 124 seconds in this configuration. Stage 3. 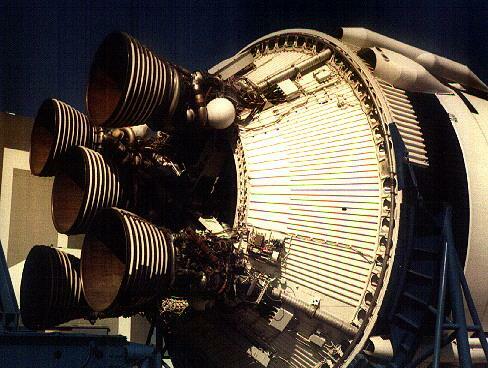 1 x Saturn II. Gross Mass: 490,778 kg (1,081,980 lb). Empty Mass: 39,048 kg (86,086 lb). Thrust (vac): 5,165.790 kN (1,161,316 lbf). Isp: 421 sec. Burn time: 390 sec. Isp(sl): 200 sec. Diameter: 10.06 m (33.00 ft). Span: 10.06 m (33.00 ft). Length: 24.84 m (81.49 ft). Propellants: Lox/LH2. No Engines: 5. Engine: J-2. Status: Out of Production. Stage 4. 1 x Saturn IVB (S-V). Gross Mass: 119,900 kg (264,300 lb). Empty Mass: 13,300 kg (29,300 lb). Thrust (vac): 1,031.600 kN (231,913 lbf). Isp: 421 sec. Burn time: 475 sec. Isp(sl): 200 sec. Diameter: 6.61 m (21.68 ft). Span: 6.61 m (21.68 ft). Length: 17.80 m (58.30 ft). Propellants: Lox/LH2. No Engines: 1. Engine: J-2. Status: Out of Production. 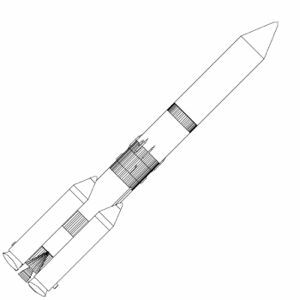 Comments: Saturn V version of S-IVB stage. Family: orbital launch vehicle. People: von Braun. Country: USA. Stages: Saturn II, AJ-260X, Saturn IVB (S-V), Saturn S-ID Booster, Saturn S-ID Sustainer.